Two weeks earlier, hundreds of local Herat residents turned out on the streets condemning the execution of Afghan immigrants in Iran. HERAT CITY: Iranian authorities executed seven Afghan refugees two days ago, their relatives in western Herat province claimed on Wednesday.The families asked the provincial government to help return the bodies of their relatives to their country of origin. Shir Gul, 40, said Iranian officials in a jail known as Taibad called him and said his nephew was hanged on charges of drug-trafficking. Gul's nephew, Mohammad Shafai, 21, phoned his family two days ago to say his last words and that his execution order had been passed by an Iranian court. Another resident of the western Afghan province, bordering Iran, Haji Ghulam Jelani, claimed that his brother, charged for similar drug-trade offences, was executed in the same prison and was buried somewhere in Iran. The Iranian authorities executed seven Afghan immigrants early Monday morning, Jelani quoted other Afghan prisoners in the jail as saying.The angry Herat locals gathered in front of the provincial governor's office on Wednesday to shared their concern with the acting-governor, Aseeluddin Jami, who pledged to help take the bodies to their families. The Iranian government has not provided the Afghan government with details about the execution of its citizens, the provincial governor's spokesman told Pajhwok Afghan News. The issue would be seriously followed up through the foreign ministry in Herat and the border police, he added. 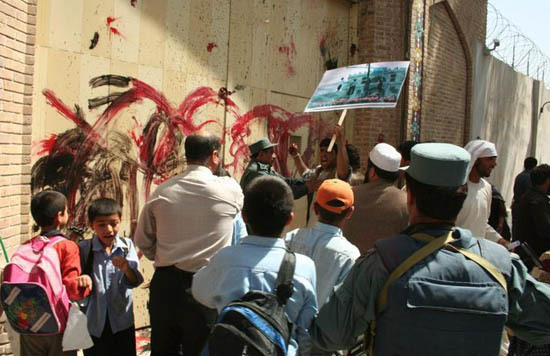 May 20, 2010: Demonstrators write protest messages against Iran at the entrance gate of the Iranian Consulate in Herat. In Kabul 80 percent of the population live in unplanned settlements where poor sanitation and lack of access to safe drinking water are common.